Late last week a super sweet bundle of fabric arrived from the lovely Shannon Lamden, the creative force behind the Aunty Cookie brand. Shannon sent me a selection of her limited edition hand printed designs in grey on a white back ground. 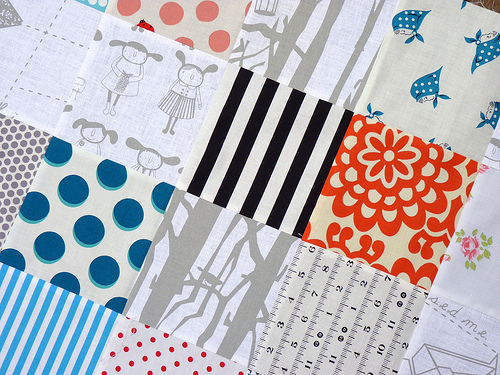 These fabrics are printed with environmentally friendly inks on a 55% linen/ 45% cotton base in Melbourne, Australia. The subtle grey/white prints are a welcome change from my otherwise bold and colorful palette, and has given has giving me the opportunity to pull out from stash some of my VERY favorite prints (there are many!). I have thoroughly enjoyed playing with these fabrics. These fabrics are truly beautiful - I love the splashes of colour you are adding. Rit...this one is gorgeous! I love the pops of blue & orange. Very nice. Love the red in there with the grey. Beautiful! Love the grey and white fabrics. Rit, this is so beautiful...love it!! I'm loving orange right now. This is going to be great! I can't wait to see more. Just love it Rita - gorgeous palette - look forward to seeing it develop! Love the pattern combinations and the pops of color. Can't wait to see more. I LOVE Aunty Cookie!!! And on a side note, I just posted something called "Sneak Peek" and spelled both words incorrectly (Sneek Peak). Argh! I do medical transcription in my real life. You would think I would know how to spell something easy like sneak and peek! And your quilt looks great so far!!! I love seeing different fabric ranges and what people do with them. Very beautiful. Love those Auntie Cookie fabrics!! 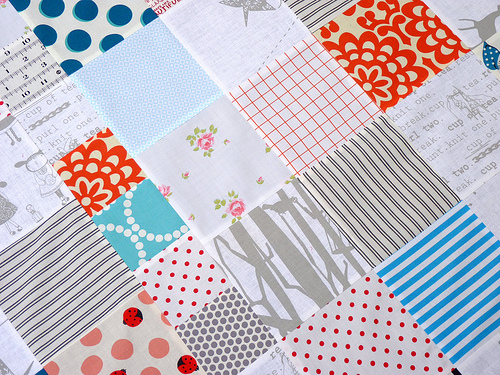 I am so intrigued by the smaller squares, can't wait to see the whole top! just gorgeous, Rita, can't take my eyes off it!! also...what's that grey stripe with the red dots?? Just LOVE it! I love the colour pops with those fabulous Aunty Cookie grey fabrics. I'm on such a grey jag at the moment - especially with plenty of white space. can't wait to see this finished! I could stare at those fun prints all day long! I love the one with words! Fabric & words are the best!!! wow, this is so pretty Rita! Oh, it's just gorgeous! 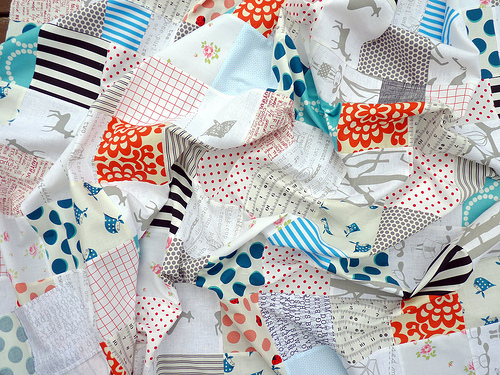 All your quilts are so wonderful, you mix colors and patterns in an awesome way.